You can even set a different capture filter for each interface if you like, or one general filter for all of them. Hint: as of the time of writing this post there is a small bug, though: when changing a capture filter for an interface, all capture filters will be cleared. The bug report for this can be found here. Unfortunately, you can’t add the name of the interface as a column at the time of writing this post, only the index. The index of the interface starts at zero, so the first interface in the file has an index of 0, the second an index of 1, and so on. In the example above you can see that I captured on 4 interfaces at the same time (Indexes 0-3). This is a complete TCP conversation that does look a little odd. For example, it starts with a SYN/ACK flag in packet 93, instead of a SYN. But the SYN is not lost, it just isn’t where it should be: you can see it in frame 145. So what happened? If you take a closer look at the delta time column you can see that the SYN packet has a negative delta time of about 59 milliseconds. If you want you can use a calculator but I can tell you right here that the absolute time stamp of that SYN packet puts it 7.5 milliseconds before the SYN/ACK. What happened here is what almost always happens when capturing on multiple interfaces with standard PC hardware: some network cards deliver their captured frames faster than others, and often in small batches instead of the correct interleaved sequence (for the exact reasons I’m the wrong guy; ask Jörg Mayer or Guy Harris if you want over-the-top in-depth details :-) BTW, Jörg had a nice talk at Sharkfest 2014 about the capture process). 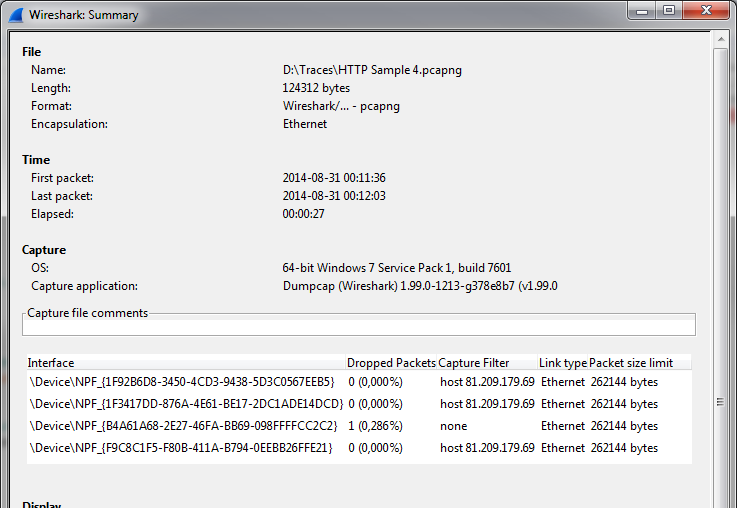 Fortunately, the frames are (usually) time stamped on arrival on the card, so at least you can see what their original timing was, but the capture process (dumpcap, in case of Wireshark/tshark) writes them to the capture file in the order they arrive. [D:\Traces]reordercap "HTTP Sample 4.pcapng" "HTTP Sample 4 reordered.pcapng"
[D:\Traces]mergecap -a -w mergedfile.pcapng "Test1.pcapng" "Test2.pcapng"
This happens when you try to use mergecap (again, part of the Wireshark installation) to merge PCAPng files that contain more than one capture interface. 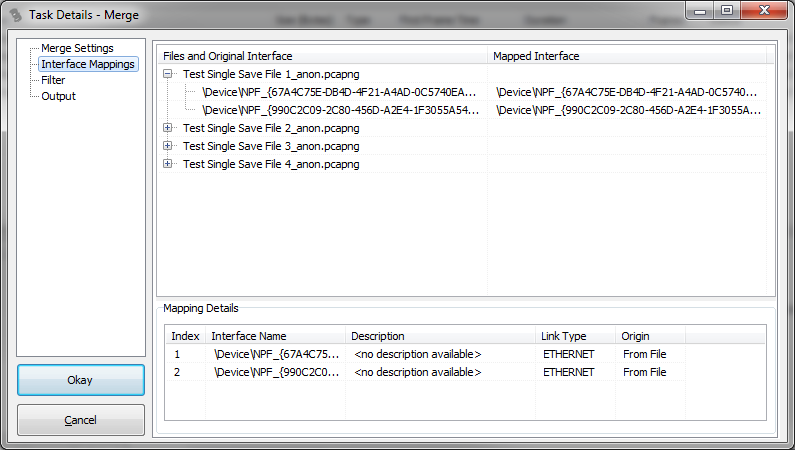 The reason is probably that mergecap has trouble determining how to merge the interface entries for the output file. Can you assume that Interface 0 in file 1 is the same as Interface 0 in File 2? Not really, because there is no unique identifier in all cases, e.g. you could have captured the files on totally different systems. How would mergecap know that it should not assume that the interface pairs are the same? It can’t, unless the link type is different – but unfortunately it is going to be Ethernet in most cases, so it doesn’t really help to look at it. So for Windows traces it is easier to merge interfaces because it is highly unlikely that two different NICs will have the same GUID as part of their name. It is even consistent across multiple capture jobs because it is assigned by the OS and will not change unless the actual NIC is replaced. The bottom list holds the list of unique interfaces that will appear in the merged file, and the upper list shows what source interface is mapped to which target interface. You can change the mapping, and add additional interfaces with a popup menu if you need. One of the things that are really useful when working with a large set of capture files is the process of extracting single conversations from them, no matter where they start and where they end. The problem is that a conversation may use only one or two interfaces, but if a capture has 3 or more in the interface list you need to find out which ones you need. Of course it would be possible to write all interfaces to the target file regardless of them being used by the packets, but that could lead to huge interface tables that are good for nothing. Again, if your capture consists of multiple files you need to merge interface entries like for the merge process we already looked at. This is what I am currently working on for TraceWrangler: allowing the extraction of one or more conversations to a new file with a correct interface list, and it requires a lot of work in the code base. Basically all frames need to be scanned before processing them, because it’s the only way to know what interfaces they use. tl;dr; PCAPng is a much better file format than PCAP, but it is also much more complex to read and write (which is probably why some people refuse to use/code for it – they’re too lazy I guess :-) ). Captures performed on more than one interfaces are hard to merge and extract parts from.